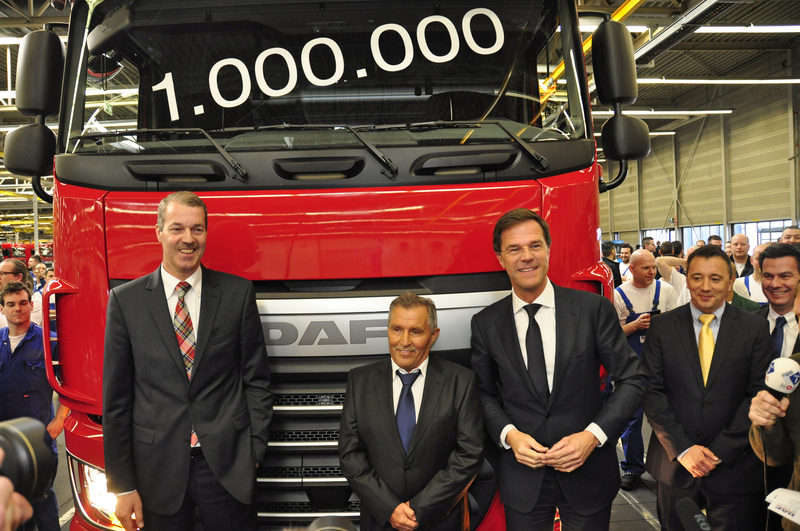 Prime Minister Rutte unveils millionth truck manufactured in Eindhoven - DAF Trucks N.V.
On Wednesday, February 25th, Dutch Prime Minister Mark Rutte unveiled the millionth Eindhoven-produced DAF truck. He then presented the truck to Mr. Bálint Révész from the Hungarian transport company bearing the same name, which specializes in bulk and tanker transport. Since the early thirties the "van Doorne's AanhangwagenFabriek" (semi-trailer factory) had focused on the production of trailers, but in 1949 the company introduced its first truck chassis and this was why the company name was changed to "van Doorne's Automobile Factory. A new factory was built on the Geldropseweg in Eindhoven for the production of trucks. In 1955 the 10,000th truck rolled of the assembly line and in 1964 the 50,000th. The 250,000th followed in 1984, the 500,000th in 1999 and in 2007 the 750,000th. The first DAF truck was sold on September 1, 1949 and that year a total of 150 trucks left the factory in Eindhoven. A year later there were more than a thousand. A stark contrast to the 36,000 trucks that DAF produced in 2014. One of those customers is Révész Group from Hungary, with a fleet of 480 vehicles specializing in international bulk and tank transport. "We are very honored to receive the millionth Eindhoven-manufactured truck to add to our fleet," said owner and CEO, Bálint Révész. "Our trucks drive an average of 130,000 kilometers per year and reliability and low operating costs are our main buying criteria, not to mention the highest driver comfort. DAF knows how best to combine all of these requirements, which is why our fleet consists of almost 100% DAFs. " Prime Minister Mark Rutte said in his speech that DAF's success proves that the manufacturing industry in the Netherlands certainly has a future. Rutte: "The millionth DAF truck manufactured in Eindhoven is the millionth piece of evidence that the prescription of the brothers Van Doorne still works. Continue to innovate, continue to grow and above all continue to invest in knowledge and people who are proud of the product they make and the company where they work. Innovation and craftsmanship go hand in hand here. "